Branding is the acknowledged key to business success providing recognition, memorability, trust and value. Surveys tell us that 60% of consumers prefer to purchase a known brand. Over time, the popularity of a product perpetuates its identity. Professional studies show a continuing increase in online shopping. They also show that people like doing business with people and hearing a human voice. A February 2018 Ad Week article points out that most online shoppers prefer to complete their purchase by live voice telephone contact. For these reasons, George Belcher, CEO of National Transcom, Inc. believes 800-vanity phone numbers are a desirable asset, which is why he is offering the 1-800-USA-TOUR number and matching Web domain names for sale. When he registered the trademark USA TOUR, his plans were to establish it as a brand and distribute its incoming calls to member operators through the caller’s area code. It was possible, however, technology in the 70s and 80s limited the economic feasibility of his plans. It is different today as technology affords opportunities for a business to become a giant beyond geographical limits. “I only wish I were young enough to take advantage of it, but age and health restrictions force me to sell the intangible assets of National Transcom, Inc.,” he laments. The properties package includes: International, Toll-free: 1-800-USA-TOUR plus domains; 1-800-USA-Tour.com, 1800USATour.com, 800-USA-Tour.com, 800USA-Tour.com and 800USATour.com. The telephone number has a clean history, and the dot-com domains have not been used in commerce. If you are looking for a case study on the success of vanity numbers, take 1-800- FLOWERS as an example. In 1982 a local florist with the sign Flowers over the door made a leap. The owners secured a toll-free vanity number and became: 1-800- FLOWERS. This expanded the local business’s geographical marketing potential. 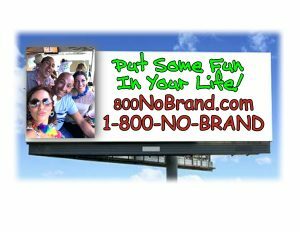 The vanity number and ingrained “800” prefix provided an easy to remember customer contact vehicle and created a highly successful national brand. When the World Wide Web emerged, 800- FLOWERS added a dot-com address and 1-800-Flowers.com became a global brand. It has been reported that if the 1-800-FLOWERS telephone number were available today, its value could exceed $10 million. Advertised to a leisure travel market, the USA TOUR package is instant global branding. The package promises a memorable brand. It also capitalizes on current technology but does not depend upon it. The travel services customer can do business with the advertiser with or without an app, computer, tablet or cell phone. Anyone with an alphanumeric telephone keypad can call 1-800-USA-TOUR. 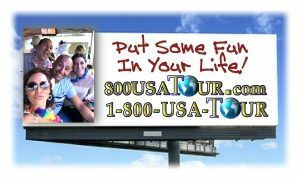 Consumers can shop 800usaTour.com on the web and dial: 1-800-USA-TOUR or its numeric equivalent to complete the sale. In China and the UK, for example, an international caller adds 00. Calls are toll-free in US states and territories, Canada, and the Caribbean. Developing support material, Belcher spent considerable time researching the elements and online international travel agencies, transportation, hospitality and other leisure activity marketing. He became convinced that the 800USATour asset package would generate sales and add value to the bottom line of any company using it. These are perfect tools for online direct response marketing. The brand identity, 800USA-Tour, is indelible and communicates stability and value while offering a multitude of inbound and outbound leisure travel experiences. Many accountants and investors say that intangible assets are out pacing tangible assets in valuing a business. Belcher would be happy to hear from any motorcoach industry contacts that would like more information regarding the asset he is selling. To contact him, email gebelcher.nti@gmail.com.